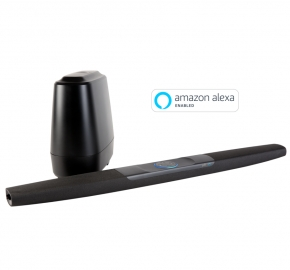 With integrated far-field microphones and Alexa voice services, use your voice to control the sound bar, smart home devices and stream music - "Just Ask." Features patented Voice Adjust technology for crystal clear dialogue, a wireless subwoofer for deep bass and 4K compliant HDMI ports. Plus, it's fully compatible with FireTV (*sold separately). Includes HDMI and Optical cables for quick and easy setup.